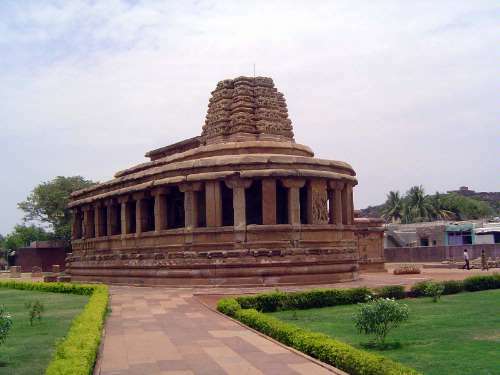 "A stroll through the old village of Aihole would leave one under the impression that, at least, in this quiet spot, no change, save that of decay, has altered the place or the sleepy life of its inhabitants in any material respect since the times of its prosperity, thirteen hundred years ago." That was Henry Cousens in 1926, and it's still roughly true. See his The Chalukyan Architecture of the Kanarese Districts (Archaeological Survey of India, volume XLII, New Imperial Series, 1926, p. 29). 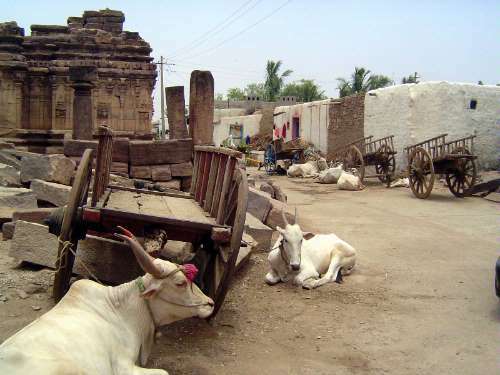 Some 30 temples are embedded in the village. 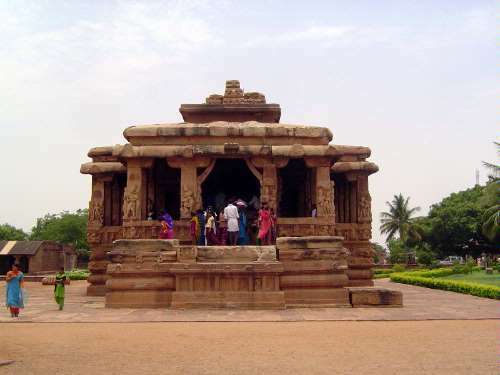 The most spectacular is the Durga Temple, so-called not from the goddess Durga but from the temple's location in a once-fortified area (fort = durga). The apsidal shape is unusual, perhaps in imitation of a cave. 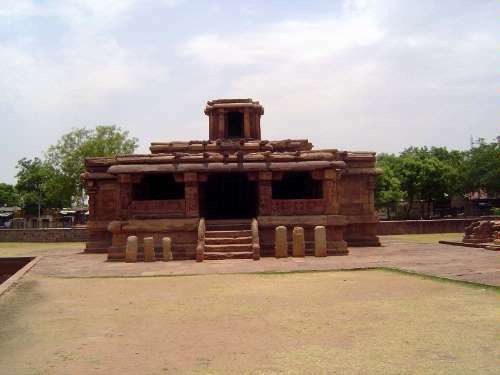 The temple, originally dedicated to Surya, was built about 720 by Vikramaditya II, but the partially collapsed spire here, unlike the square-shaped ones built at Pattadakal also during his reign, is in the northern or parabolic style. 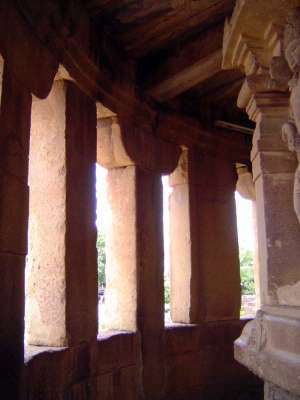 Path around the shrine; the inner surface is ornamented but the outer one remains plain. 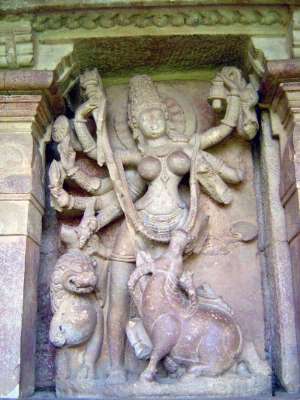 The goddess Durga; there is a matching image of Shiva. 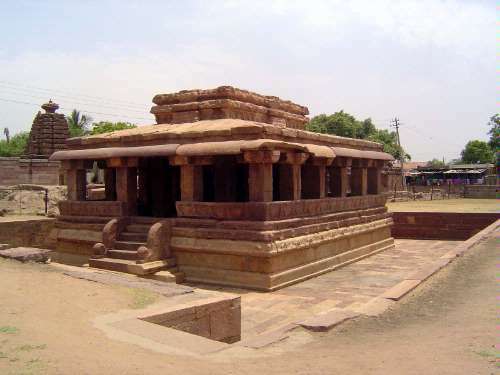 Perhaps a hundred meters south of the Durga Temple is this, the Lad Khan Temple, its name merely that of the Muslim occupant of the temple early in the 20th century. 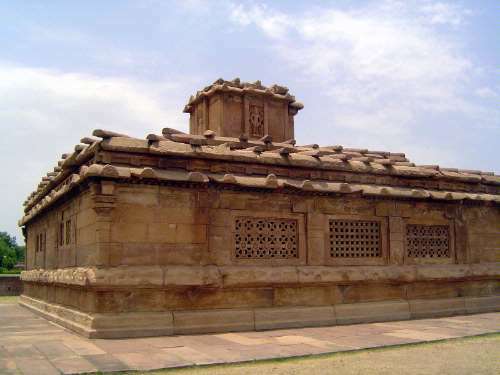 The second, inaccessible, story consists of a shrine elevating its deity, possibly Surya, closer to the sky. 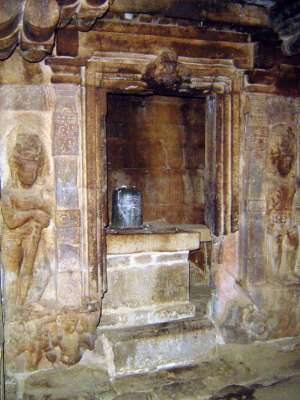 The lower level contained a shrine to Vishnu. Plain exterior walls enlivened only by lattice windows. 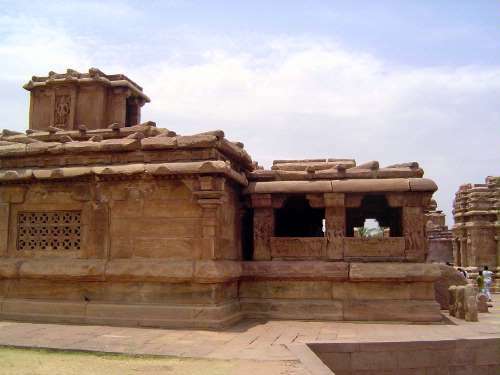 The stone columns laid across the roof may hint at the conventional practice of stabilizing a thatched roof by laying logs atop it. 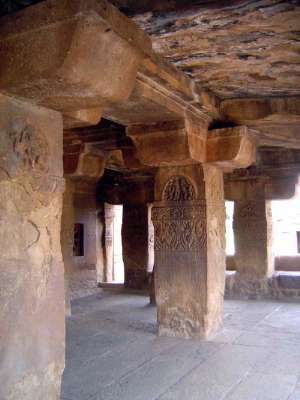 The interior is massive and, as Cousens wrote, "more suited to support the heavy rock in a cave cutting than the lighter roof of a structural temple. The shafts are single heavy square blocks, without bases, from the floor to the bracket-capital, the last being a separate stone." 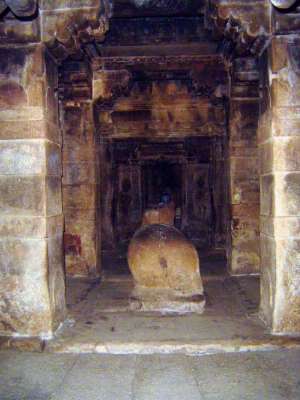 Interior; the temple was converted at some point to the worship of Shiva; the Nandi was then put in place. 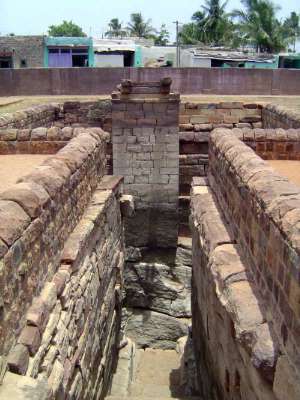 The Gaudargudi temple, dedicated to Durga and partly hidden until recent excavations. Unlike Lad Khan, it has no solid exterior walls.